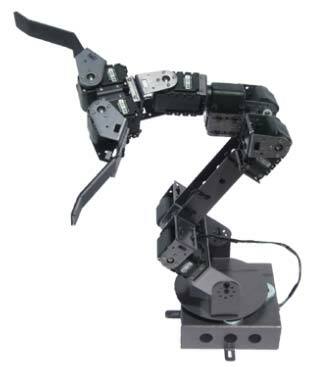 The VPL-RA-18A is a sophisticated and powerful robotic arm. The robot actuators contain a precision DC motor, gears and electronics all within a single modular package. These have 300 degrees of movement in 1,024 increments with full control over speed and torque. Other features include all aluminum rugged construction, hard Anodized finish for maximum scratch and corrosion resistance, Smooth, sealed, self lubricating ball bearing turntable , Compatible with any micro-controller/computer control system / programming Language (Open Source), Sensor engineered gripper design accepts, pressure sensors, IR detectors, CCD cameras and more.